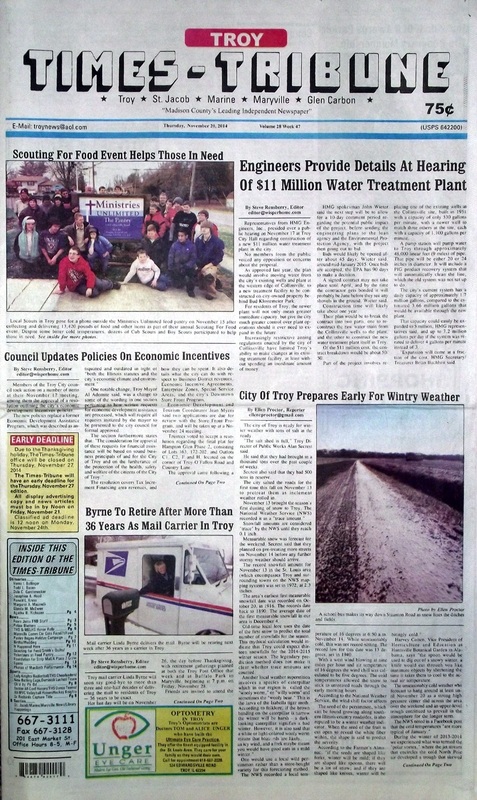 The November 20, 2014 issue of the Troy Times-Tribune is now available. Some of the stories in this issue: Engineers Provide Details At Hearing of $11 Million Water Treatment Plant, Council Updates Policies on Economic Incentives, City Of Troy Prepares Early for Wintry Weather, Byrne To Retire After More Than 36 Years as Mail Carrier in Troy, Maryville Community Center To Get Facelift for the Holidays, Food Pantry Begins Holiday Season Fundraising Campaign, Triad Cheerleaders Have Busy Winter Schedule, Smith's Quilts Warm Hearts Too, A Place 2 Grow Child Care Learning Center Opens; plus we have police blotters, a column about giving, a whole page of photos of the recent THS Mcbeth performance, news about upcoming events, a whole lot more. We have obituaries for Verna I. Bollinger, Todd L. Bacon, Dale C. Gerstenecker, Josephine A. Hood, Margaret A. Masinelli, Glenda M. McEwen, Ronald L. Kress, and Agatha B. Richeson.